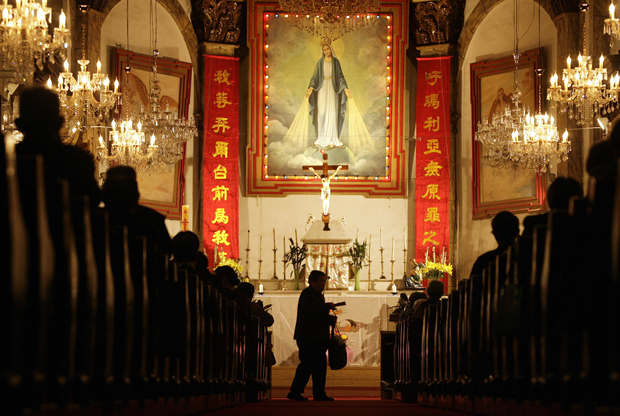 Catholics attend an early morning mass at Beijing’s Immaculate Conception Cathedral, also known as South Cathedral in May 2006. University of Chicago Press, 464 pp. Oxford University Press, 245 pp. Yale University Press, 333 pp. This article was first published in the December 22, 2011 issue of The New York Review of Books. The end of this system began with a series of reforms promulgated in 1898 by the government of the Dowager Empress. Temples were to be converted into schools—in fact a widely circulated slogan was “destroy temples to build schools,” setting in place the fundamental claim of subsequent eras: that religion was antithetical to modernization. Although short-lived, the measures gained traction after the 1911 revolution. The child emperor Pu Yi’s abdication didn’t just destroy the symbolic center of China’s political-religious order. His departure was the culmination of decades of crisis. For many Chinese thinkers at that time, the only conclusion—troubling as it was—was that China’s ancient system of values could not offer a way to counter the West’s military and industrial might. At first, most Chinese resisted this conclusion but by the early twentieth century it became inevitable: instead of trying to impose Chinese values on foreigners, the elite now would emulate foreign cultures. Today, we can see this in the style of Chinese cities, the clothes Chinese wear, their hairstyles, many of their manners and customs, and of course their economic and political systems—all of them, including communism, versions of Western prototypes, even if they have been modified for Chinese circumstances. Underlying these changes was the attack on what had been seen as the country’s soul. If religion had previously held together ancient China’s social and political system, now it became the target of China’s top-down modernizers. So violent was the self-hatred that almost all Chinese religious practice was condemned as “superstition,” a term (mixin) imported to China from the West via Japan (as indeed was the word for “religion,” zongjiao). Western religion, especially Christianity, came to be considered by many to be the norm of acceptable religious practice. That norm called for an identifiable clergy organized in a hierarchical institution and a clear doctrine expressed in a well-defined corpus of sacred texts—features typical of world religions but not of China’s indigenous belief systems. For many years, however, even Christianity had a hard time in China since many Chinese condemned it as an imperialist foreign import. China was in the midst of what many scholars believe to be the most sustained attack on religion in history.1 Even before the Communist takeover in 1949, half of the country’s one million temples had been converted to other uses or destroyed.2 Over the next thirty years virtually all of the rest were wiped out; by 1982, when religious life was permitted to resume after the ouster of radical Maoists, China had just a few score temples, churches, and mosques still in usable condition—in a country that now had one billion people. That might sound hyperbolic but Chinese now live in a nation without an accepted code of moral obligations. During the past few months, Chinese have been hearing about cases of passersby who have not helped people in need. In one case, a young girl was run over by a minivan twice before someone pulled her out of the street (she later died in a hospital). In another case, an old man fell in a market near his home and no one picked him up; he suffocated from a nosebleed while a crowd of people—including many vegetable sellers who knew him personally—stood by and watched. Part of the problem is that China lacks a “Good Samaritan” law to protect people who do good deeds from being sued if something goes wrong. Ever since a court ruled in 2006 that a man had to pay some of the medical costs for a person he rescued, many Chinese have shied away from helping others. But the problem is more than five years old. Selfishness might be universal but it’s particularly pronounced in Chinese society. As the sociologist Fei Xiaotong noted in his book From the Soil about early-twentieth-century rural China, peasants are mainly concerned with their friends and family; those outside their guanxiwang (network of guanxi, or relationships) don’t count. But these tendencies were mitigated by traditional religions, which promoted ideas of helping the poor and weak. The lack of such influences has left China a harsh place. Indeed, the comments on some of these recent cases have been callous. One writer, without any apparent irony, said that old people nowadays can’t be trusted because they grew up in the early Communist era, when religion was all but banned, thus depriving them of a moral backbone. But this cynicism is changing. After three decades of prosperity—the first significant period of stability in 150 years—Chinese have quietly but forcefully initiated a religious revival. Hundreds of thousands of places of worship have reopened or been rebuilt, often from scratch, many of them not registered with the authorities. China now has the world’s largest Bible-printing plant, while thousands of new priests, nuns, and imams of various faiths are being trained every year. It’s no exaggeration to say that China is in the grip of a religious revival analogous to America’s Great Awakening in the nineteenth century (which also took place during a time of great social upheaval). By some measures, more Chinese (60 to 80 million) now go to church every Sunday than all the congregations of Western Europe put together, while China is now the world’s biggest Buddhist nation. Meanwhile, indigenous belief systems, such as folk religion or redemptive societies like Yiguanddao, are making a comeback. Much religious activity is still suppressed. Unregistered churches are regularly closed (especially the well-known, and technically illegal, Shouwang Christian church in Beijing), while in the sensitive ethnic regions of Tibet and Xinjiang, Buddhism and Islam are tightly monitored, with violations of human rights that rightly gain much international attention. And of course any group that the government feels is a threat (most spectacularly the Falun Gong movement of the 1990s) is persecuted. Still, religion is growing breathtakingly fast. Unregistered “house churches,” once quasi-underground groups, sometimes approach the scale of American mega-churches. I went to an Easter service in Beijing this year that filled an auditorium. The pastor outlined his sermon with a PowerPoint presentation while a dancing choir kept people’s eyes riveted on stage. Daoism, China’s only indigenous religion, is also growing fast, with thousands of temples once labeled “superstitious” now reopening. Overall, official figures show a tripling of Daoist places of worship over the past fifteen years. All of this is happening despite tight government controls. The Chinese state recognizes only five religions: Buddhism, Daoism, Islam, and Christianity, which for official purposes is treated as two groups: Catholicism and Protestantism. All have centralized governing bodies with headquarters in Beijing and staffed by officials loyal to the Communist Party. The Party appoints top religious leaders and bans nonapproved sects like Falun Gong. This makes current government policy more in line with that of the old Qing dynasty. The government decides what is orthodox and what is heterodox and, with some important exceptions, largely supports activities that are not hostile. Indeed, in many ways, it is a generous patron of religion, helping to arrange for bank loans to temples or paying outright for new church construction. Some speculate that the government still views religion in Marxist terms as an opiate of the masses—the twist is that instead of eradicating the drug, the Party hopes to use it to keep people diverted from politics. While that may be true, it’s also clear from the writings of some government leaders that they see religion as helping to hold together a country undergoing large-scale urbanization, with roughly ten million people a year moving from the countryside to the cities. This social dislocation is being eased by temples, mosques, and churches, which provide social services and a local community of believers to help people cope with the hardships and isolation of urban life. How this happened is the overriding interest of the increasing number of studies of Chinese religion in the West, Japan, Taiwan, and Hong Kong. (In the People’s Republic, there is also a trend toward such studies, although the political interference endemic in Chinese universities limits the value of religious scholarship.) A couple of decades ago, few universities bothered with Chinese religion.4 Now, almost no major university is without at least one professor who studies contemporary China’s religious life. One of the most prominent members of this new wave of scholars is Fenggang Yang, who was born in mainland China and studied there before moving to the United States in the 1980s. Yang’s book Religion in China has brilliant chapters, some controversial but all provocative and worth considering. Perhaps most novel is his use of market theory to help explain today’s religious landscape. Yang says China suffers from a “shortage economy.” Demand for religion is strong but, like consumer products in a Soviet-style economy, supply is lacking. Evidence of this is easy to find in China—almost every church is bursting with congregants on Sundays, while temples and mosques are being rebuilt as fast as authorities grant permission. This lack of a supply of established religion, according to Yang, leads to “forced substitution,” such as practicing folk religion but calling it “culture.” Political leaders pay homage each year to the Yellow Emperor, the legendary founder of civilization, saying they are following Chinese tradition. Another substitution, according to Yang, can be seen in the popularity of physical exercises such as qigong, which often are accompanied by moral strictures. Most famous of these groups is Falun Gong, which was banned in 1999 after it began criticizing the government for what it saw as endemic corruption and amorality in society. In Yang’s view the underlying appeal of Christianity is that it offers clear moral guidelines in a country where it often seems that anything goes. Christianity in China has been heavily studied over the years but two new books offer much of interest. One, God is Red, is the journalist Liao Yiwu’s account of the persecution of Christian churches. Liao is best known in the West for his reports on grassroots China, collected in The Corpse Walker,5 and for his decision earlier this year to flee China for the West. The subtitle of his new book, The Secret Story of How Christianity Survived and Flourished in Communist China, is a bit grandiose—it isn’t really a secret history and the book isn’t as comprehensive as it sounds. In fact, Liao concentrates mainly on the border area of Yunnan, which is populated by non-Chinese ethnic minorities. He also writes considerably more about oppression than about revival. But as with The Corpse Walker, the stories are meant to be more allegory than history. Liao, who himself spent four years in prison for writing a poem criticizing the 1989 Tiananmen massacre, is more interested in emphasizing the faith that sustained Christians during their years of persecution. His book has many stories of imprisonment and torture but also inspiring tales of perseverance. It is impossible to read them without being appalled by their heroes’ fate while also admiring their fortitude. It is, however, The Religious Question in Modern China, by Vincent Goossaert and David Palmer, that is the most telling of all the recent studies. Goossaert, a research fellow at the CNRS, in Paris, is one of the leading researchers on Daoism, while Palmer, of the University of Hong Kong, wrote a history of the qigong movement.7 Their book takes into account the huge wealth of insights into Chinese religion accumulated by the new research, and gives a very clearly written account of a truly remarkable event: the destruction of one of the world’s richest religious traditions and its replacement by a congress of competing traditions, faiths, and beliefs. This is sometimes a depressing story. Many traditions have been lost and much of the remaining liturgy has been reduced to a kindergarten level. I once visited a Daoist puppet troupe in Henan province that formerly had a repertory of thirty passion plays that it performed on religious holidays. By the late 1990s, however, only two of the older members were still active and the younger members didn’t have the time to learn more than three plays. The rest were lost—no one had written them down or recorded them. Such loss is the result of the systematic eradication of local memories. Urbanization contributes to the trend, wrenching people out of their ancestral villages to new lives in the cities—which themselves are subject to “urban redevelopment” that wipes out old streets, temples, and other landmarks to make way for the rich. In Beijing, for example, almost none of the city’s neighborhood music troupes—all of which had a religious function—remain. Hundreds were banned and then, when policy was relaxed three decades ago, their members had been scattered across the city after their homes were torn down. The members slowly drifted apart. Today, just one troupe is left. Even when religious life has been restored, the government maintains a heavy hand. For centuries, Chinese rulers have sought to define religion and ban heterodox faiths. Now the modern authoritarian state is worried about the growth of groups that operate outside its control, and its fears are not unfounded. Faith is giving rise to more social and political activism, fostering the growth of NGOs that are resisting government control over life. Some argue that religion will democratize China. This may be wishful thinking, since in some ways, religion can be a pietistic escape in a country where politics is out of bounds. But religion is also creating rudimentary forms of civil society. In countries like Communist-era Poland and East Germany, religious civil society helped undermine authoritarianism. A similar process—albeit a slower one, as one would expect in a continent-sized country—is going on in China. Most Christians are apolitical, saying they incorporate traditional Chinese values of upright living, filial piety, and hard work. And yet it’s no coincidence that a hugely disproportionate number of political activists are Christian, especially the weiquan, or “rights-defending” lawyers, who take on politically sensitive cases. The government’s problem in countering these trends is its lack of moral authority. It can enforce the appointment of bishops or Tibetan lamas and try to claim the moral high ground by talking about quasi-religious concepts such as a “harmonious society”—the slogan of the outgoing administration. Yet they are avowedly atheist. For believers, this makes the government’s efforts to guide religious life hollow. Adding to the strains on China’s neo-Qing form of religious control are the country’s connections with global religious life. New Age pilgrims visit China seeking martial arts masters and Buddhist lamas, while evangelical missionaries are reentering China for the first time in two generations, convinced that China is the final piece of the puzzle needed for Christianity’s global triumph. Meanwhile, Chinese folk religion and Buddhism are helping to strengthen ties to Taiwan and Southeast Asia, while Islam is a point of contention and a bond with the Muslim world. The state is caught between lethargic self-satisfaction and a paralyzing fear of unrest, and it seems unlikely that it will be able to modernize China’s antiquated system of religious oversight. After a century of bitter experience, religion remains at the core of China’s transformation.